When it comes to tablets, you want a powerful but compact device. 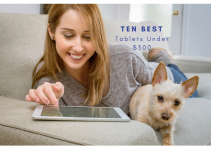 The 10-inch tablets are some of the oldest and most iconic tablet designs available, and they’re packed with a ton of useful features to enhance your experience. But, there are dozens available, and this can be overwhelming when you’re trying to find the best one for you. We’ve rounded up the top ten 10-inch tablets and compiled reviews of them so you can compare them side-by-side. Our easy-to-follow buying guide will also highlight the important components you want to consider when you’re looking for a new tablet. The tablet’s brand is an important consideration because the more well-known your tablet’s brand is, the more access to support you should have. Also, more people will have purchased this particular brand ahead of you, and you can double check for any outstanding issues or defects that may come with this brand’s tablets. A stand-alone tablet works and looks much like an oversized Smartphone. 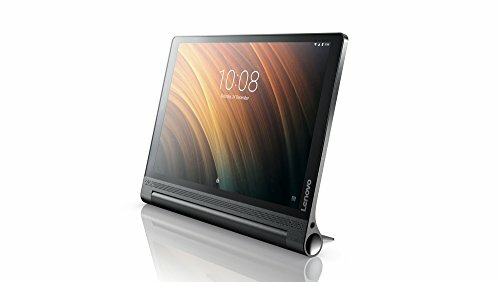 You get a large touchscreen, a case, basic volume and on/off buttons, and a charging connector. They’re usually very thin and lightweight, and you control them through the touchscreen. Convertible tablets offer slightly more, but you’ll usually pay more for it. You get the flexibility of a PC with the compact size of a tablet. They usually come with a detachable keyboard, or they’re like a full-sized laptop with a touchscreen. Your tablet’s operating system will determine what software will work and what software won’t be compatible with your tablet. Windows, Android, and iOS are the three main operating systems tablets run on. Android and Windows allow for greater software and application compatibility while iOS is more selective to Apple software and applications. Look at the applications and software you use and see what operating system is compatible with it. You could argue that your tablet’s screen is one of the most important factors to consider when you’re tablet shopping. The tablet screen’s panel type and the resolution determine how sharp your viewing area is, the viewing angles, brightness, color accuracy, and the vibrancy. Ideally, you want your tablet’s resolution to be as close to 2,560 by 1,600 as possible. The higher the resolution is, the sharper your images will appear. Also, look for a screen with plane-line switching (PLS) or in-plane switching (IPS). You want to ensure that your tablet has enough storage to support everything you want to do while keeping your tablet operating at peak speeds. Obviously, the fewer applications or software you want to download and the fewer things you want to store will play a role in your storage wants. It’s a good idea to look for a tablet with at least 16GB of internal storage. Many tablets come with 32GB, and microSD cards allow for additional external storage. The stylus is completely optional, and you don’t necessarily have to have one to enhance your user experience. Tablets are touchscreens so you can use your finger to navigate around. However, if you plan to draw or write with it, you may want to consider getting a tablet with a stylus. They can make it easier to navigate around your tablet, and they won’t smudge the screen as much as using your finger would. This tablet gives you vivid colors with an AMOLED display that features a high dynamic range. 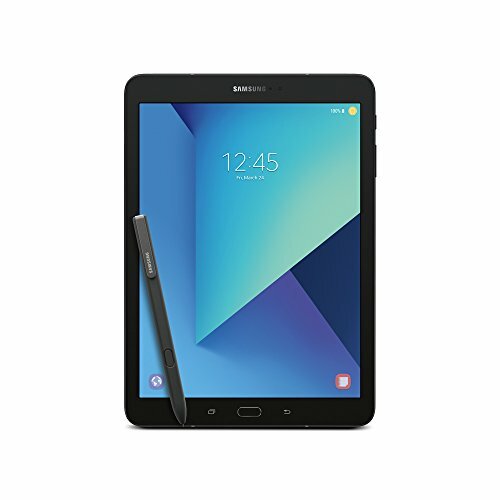 This compact tablet features a redesigned S Pen that is more pressure sensitive and allows for more precise drawing capabilities. It is battery-less and slim, and it mimics the feel of drawing with a regular pencil. It comes with AKG powerful quad speakers that automatically calibrate with any movements you make without any audio lag. You can also purchase an optional keyboard that lets you switch from the touchscreen to typing on the keyboard. There are three customization options, and you can purchase the tablet. 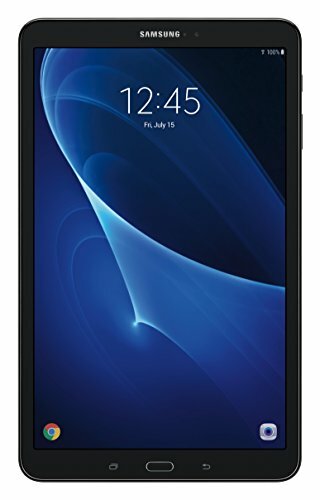 Samsung’s Galaxy Tablet has a powerful 1.6 GHz Exynos 7870 Octa-Core processor and a very bright, vivid display. 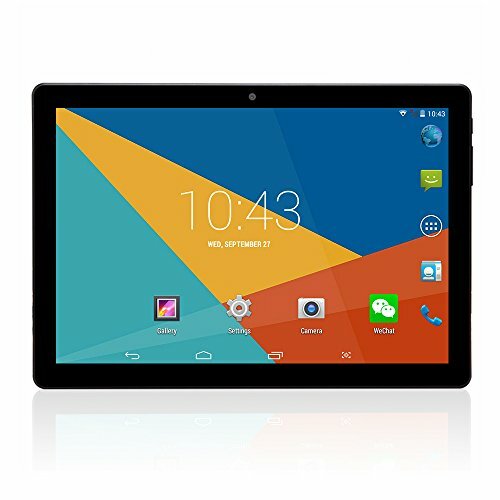 You can choose to expand the tablet’s memory with a microSD card for additional storage. It also comes with a larger 10.1-inch screen. You get the Android 6.0 Marshmallow system with this device, and it also comes with a few accessories. You get the tablet, a microSD card, micro USB cable, travel adapter, and a quick start guide. It also has rounded corners and an ergonomic design for additional comfort when you use it. This sleek and modern tablet has luxurious and clean look that translates into the leather patterning and the slim metallic band. The large display comes with ASUS TruVivid technology for bold colors and crisp images. You also get a dual camera with 5MP and 2MP capabilities. This device has a Quad Core 64 bit MediaTek processor for quick functions and a powerful user experience. The DTS Headphone integration allows you to have virtual surround sound when you use them. It runs on the Android 6.0 operating system for a quick and responsive design. This tablet’s screen features a bright 2K IPS display, and it is made with a durable Corning Gorilla Glass cover to prevent shattering or cracks. You get an 8MP and a 5MP camera that allows you to take great pictures on the fly. It has a very lightweight and sleek design as well. This device combines a Dual Core ARM Cortex 2.1 GHz with a Quad Core ARM Cortex 1.7 GHz for a very fast and stable processor that can handle streaming and a variety of games. It also has an accurate and fast fingerprint sensor for added security measures and convenience. The built-in dual speakers on this tablet feature Dolby Atmos for surround sound and a theater-quality sound. You can connect through Wi-Fi or Bluetooth to stream your favorite shows or play your apps. The rear camera comes with 13MP auto-focus capabilities, and the front-facing camera has 5MP fixed focus. This Android tablet has a 10.1-inch full HD IPS screen that makes it easy to binge watch your favorite shows or movies. You get a crystal-clear screen quality with sharp lines and bright colors. The built-in stand offers four viewing modes for additional comfort. Choose from just the tablet or a package with the tablet and the S Pen. This compact tablet has an ergonomic design with rounded corners for additional comfort, and it features 16GB of built-in memory. This allows you to download your favorite media or games quickly and easily. You’ll enjoy a powerful 1.6 GHz Exynos 7870 Octa-Core processor paired with the Android 0.6 Marshmallow operating system for a fast and responsive experience. You have a large 10.1-inch display, and you get dual cameras. The front-facing camera has 2MP while the rear-facing camera has 8MP for clear, sharp pictures. Dragon Touch’s tablet comes with the Android 7.0 Nougat operating system paired with the powerful MTK 64-bit Quad Core CPU to ensure a smooth experience with little to no lag. You get 1GB RAM and 16GB EMMC internal storage so you have plenty of space for your photos and apps. The screen comes with an 800 by 1280 IPS display with a 178-degree viewing experience from all angles. 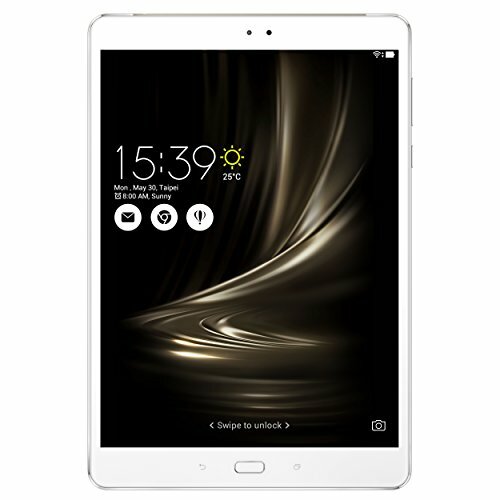 This tablet supports Wi-Fi 2.4GHz, GPS, FM, and Bluetooth 4.0 for connectivity. You can get up to six hours of streaming time out of a single charge, and the battery will charge fully within four hours. 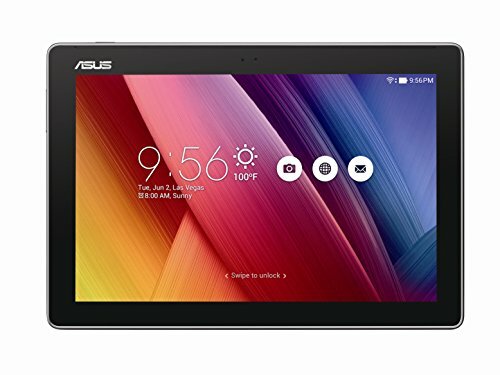 This newer model tablet comes with a MTK Quad Core CPU combined with the Google Android 6 Lollipop operating system for a stable but powerful system. You get built-in Wi-Fi and built-in Bluetooth that allows you to connect seamlessly and quickly. You get 1GB+16GB of storage, and this allows you to download all of your apps and stream your favorite shows. It can also support an additional 32GB of storage through an external micro SD card. The 10.1-inch IPS screen has a high resolution, and there is also a dual SIM card so you can connect virtually anywhere. 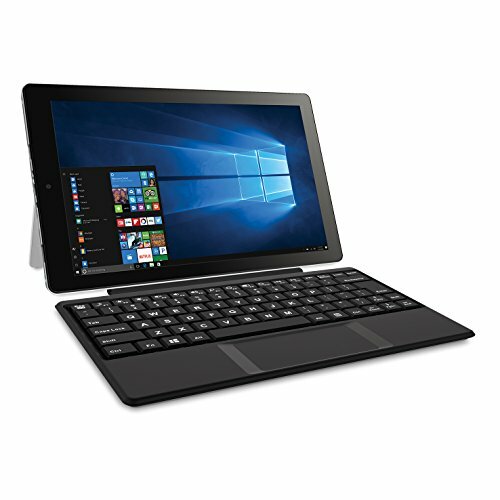 This dual tablet and PC combination gives you the power of a PC in the compact size of a tablet. It runs on the Windows 10 operating system with a powerful Intel Atom Processor Z8350 and 2GB RAM. You get all of the Microsoft Office apps with this tablet. The 10-inch touchscreen features a 1280 by 800 IPS display, and the Kickstand lets you adjust the viewing angle for hands-free operation. The keyboard snaps securely into place, and it is very lightweight. You get USB 3.0 and mini HDMI ports along with a MicroSD card slot. 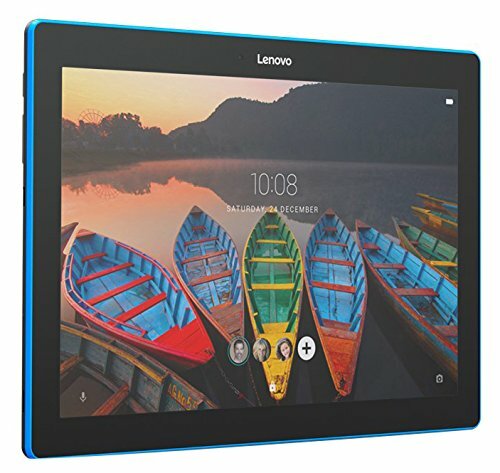 Lenovo’s tablet features a unique multi-account capability that allows several different users to customize their individual profiles. It also has a Kid’s Mode interface that lets the adults monitor and restrict site access. You get up to 10 hours of battery life on a single charge. This 10-inch tablet has a brilliant display with built-in dual speakers that feature Dolby Atmos Audio for a surround sound experience. You get the tablet, charging cable, quick-start guide, cleaning cloth, and a safety guide. It’s equipped with a powerful Qualcomm Snapdragon 210 Quad-Core 1.3 GHz processor as well. 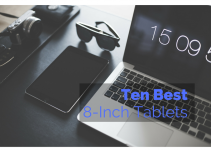 These ten compact tablets all offer the users a chance to have a powerful tablet in a lightweight and durable design. They’re excellent for anyone who finds themselves working while they travel or on the go. 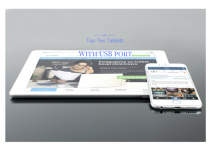 Our buying guide gives you important criteria you want to look for in any tablet you purchase, and the reviews allow you to compare the top ten 10-inch tablets on the market today. You should be able to take this information and match it to a tablet that will suit all of your needs for a streamlined experience.